The Grow Biointensive site has added a Self-Teaching section with a handbook and videos that you may find helpful. Community Crops beds are dug 3-4 ft wide and 8-20 ft in length. The width provides a manageable distance for working in the bed without ever having walk in the bed again. This helps to alleviate soil compaction, keeping air space in the soil at an optimum 50%. Dig a trench one shovel-length deep (nine or ten inches) and the length of your planting area. Add organic material, such as compost, and any necessary soil amendments. Using a spading fork, thoroughly mix them into the subsoil. Dig a second trench parallel to the first and repeat steps 2 and 3. 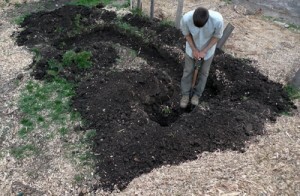 Use the topsoil from the second trench to fill the first one, adding more organic matter and mixing it in. Repeat the procedure until you’ve dug, enriched and amended the entire planting area. Fill the last trench with the topsoil you put in the wheelbarrow when you dug the first trench, enriching it with organic matter as you did before. Read more about the Community Crops gardens.